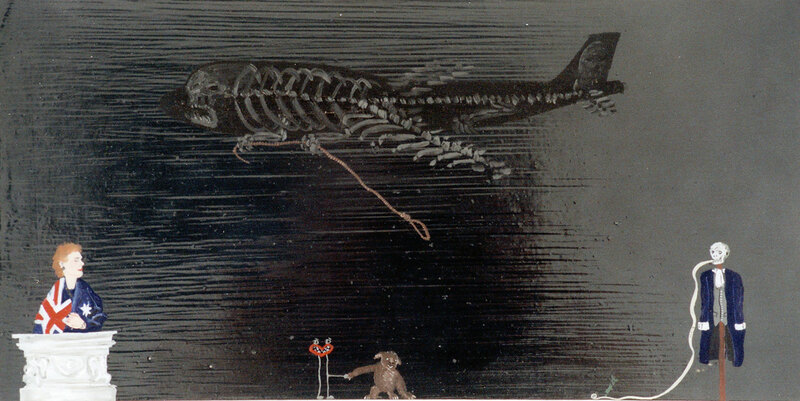 Here is the original image that I used as raw material for the previous post. I'm not sure when I saw the image for the first time, but it is reproduced in an Australian photographic catalogue called Mirror With A Memory, I think by Helen Ennis. I bought a copy of the catalogue at the National Portrait Gallery in Canberra while in holiday in Australia in 2003. 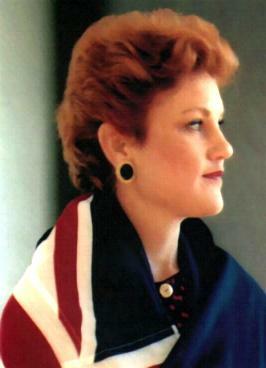 The closest I have to a 'royal' image - Pauline Hanson wrapped up in an Australian flag on a marble capital. I can't remember what the title of this painting is, nor who owns it but it was shown as part of 'Panoramas and Painted Objects' at Janne Land Gallery, Wellington, 2001.